The Grapeland Independent School District Board of Trustees were honored for School Board Recognition Month during the school board meeting on Monday, Jan. 22. The board was presented with gifts of appreciation for the hard work and dedication they provide to the school district. Photo by Sarah Naron/ Messenger. 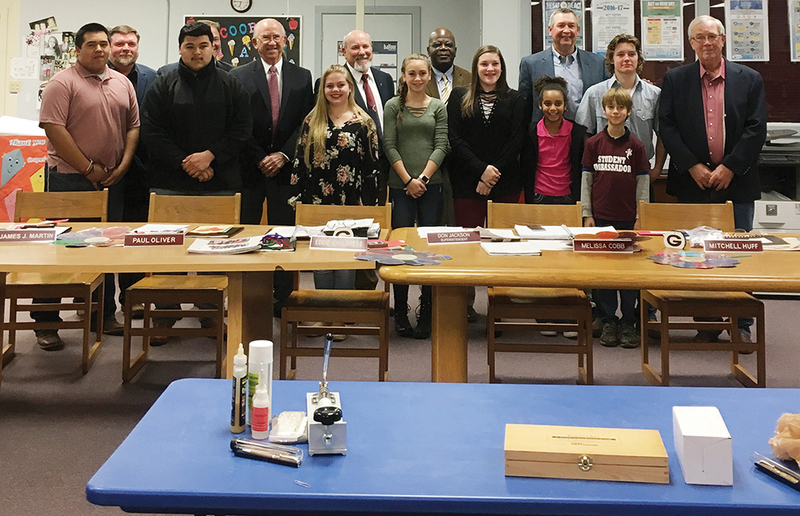 GRAPELAND – The members of the Grapeland Independent School District Board of Trustees received several gifts in honor of School Board Appreciation Month during their regularly scheduled monthly meeting held at 6 p.m. Monday, Jan. 22 in the Grapeland High School library. Among the gifts received by the board members were ink pens made by GHS students Dylan Duhon, Saruhen Velasquez and Jacob Barbosa, who explained to the board the process of creating the gifts. According to Duhon, the first step involves choosing the wood from which the pen will be made. Choices included cedar, cypress, mesquite and pecan. After the wood is reduced to the desired size, a seven millimeter hole is drilled to accommodate the inner tube of the pen, which is glued in place before the pen is placed on a lathe. Velasquez then took the floor to continue the explanation of the pen-making process. The third tool, as Velasquez explained, is used to create designs and shapes on the pen. Rounding out the presentation was Barbosa. “Once we get done with those two processes, we move to the glue,” he explained. According to Barbosa, the glues used are “just normal CA glues,” similar to superglue. An activator is then sprayed onto the wood. “Then, we move to the second glue. We’ll put three different other coats on that, and we do that all back to back. In between, we’ll also spray the activator on there,” he said. A designated tool is then used to remove excess glue and make the pen easier to work with. The micro mesh sheets are responsible for polishing the wood. A pen press is then used to combine all of the components of the pen. According to GHS Ag instructor Gary Graham, the pens were made using local wood. Student ambassadors from Grapeland Elementary School were on hand to help principal Cassie Satterwhite present the board members with tokens of appreciation such as kites made by the students in kindergarten and the school’s after-school care program. Each of the board members also received a coaster emblazoned with the district’s logo made by Teri Fraunberger, Director of Student Affairs. Gift certificates to Little Mexico in Palestine were also presented on behalf of the Grapeland Junior High students. Following the meeting, the board members enjoyed a steak dinner organized by administrative assistant Kathy Richmond.